The Society of Collision Repair Specialists announced Thursday it had posted a free, 16-minute video about resistance welding in auto body repair. The film, available on SCRS’ YouTube channel, will be the first part of a trilogy on the subject, similar to its MIG/MAG educational video series released over the summer. “This discussion topic in the 16 minute video focuses on power and preparation considerations in the welding process,” SCRS wrote in a news release Thursday. The timing is fortuitious. General Motors this summer warned that from the 2018 model year forward, the company will outright require repairers to use only squeeze-type resistance spot welding in situations where MIG plug welding had previously been acceptable. Shops who want to work on future vehicles from the nation’s No. 1 auto manufacturer will have to buy a GM-approved squeeze-type resistance spot welder and know how to properly use it. 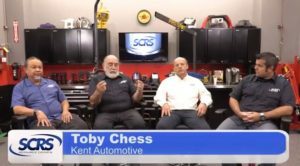 The new SCRS video features SCRS Chairman Kye Yeung (European Motor Car Works) and board member Dave Gruskos (Reliable Automotive Equipment). It also features SCRS Education Committee Co-Chairman Toby Chess (Kent Automotive) and former Chairman Barry Dorn (Dorn’s Body & Paint). Gruskos, Chess and Dorn can all be seen during the Society of Collision Repair Specialists’ Repairer Driven Education series later this fall at SEMA. Register here for individual classes or the series pass package deal. In the meantime, those hungry for more welding knowledge can check out the MIG/MAG welding series below.